Rex Warren Perkins left his mark in the courtrooms of Arkansas and on the lives of all who knew him. Bold, articulate, and full of himself, he arrived at the University of Arkansas in 1928 with his fiddle, five dollars, and a blue serge suit. Within five years, he graduated law school, was elected to public office, and ran headlong into a federal grand jury. Embattled on all sides, he fought back, locking horns with the indomitable Roberta Fulbright, publisher of the city’s newspaper and mother of future Arkansas senator J. William Fulbright. 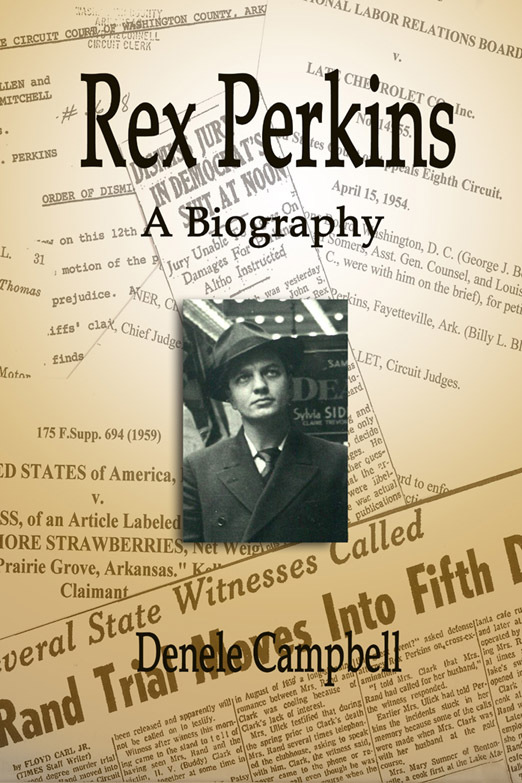 The biography of Rex Perkins tracks his family heritage from the seventeenth century, documents his rise to fame as the preeminent trial attorney of Northwest Arkansas, and recounts the most famous cases of his thirty-year career. The story also reveals the private life of a passionate man who loved nature, music, and his family. Most of all, he loved the practice of law. Fifty years after his death, his dynamic personality and his exemplary skill as an attorney are fondly remembered. Rex’s sister, Ettalee, was my great grandmother. I knew little about my family history, except what was told to me by my grandmother, Lee Jane Harris. I have, in recent years, been researching ancestry details among other things, and have been amazed at the stories and connections I have found in my family along the way. Granny told of Ma and Pa Perkins on more than one occasion. Ettalee was the eldest of the Perkins sibling trio and, quite possibly, more colorful of a character than her younger brother Rex. I have often wondered how in a town so small and poverty stricken with the majority of its residents, my family seemed to never really suffer at the hands of the unstable economy. I am still involved in my research, but have several family pictures, which include Ma and Pa, Ettalee, Rex and Ruth Perkins. My uncle James Harris, great nephew of Rex, is an attorney at the University of Arkansas, representing the University as Executive Director of Gift and Estate Planning (https://www.hallestill.com/our-team/james-l-harris). I thoroughly enjoyed reading your biography about Rex. Thank you! What a lovely note you’ve sent! I loved every minute of my research on Rex and the whole family. I’m planning to create a Facebook page about this book which would be a great place to share your comments and photos, if you’re interested in doing that. One thing I’ve found in researching this and other local history is that the story is never finished.